Wow, this amazing summer of 2015 just won’t end. It started early and it’s still going. It’s been a busy summer for me, and I’ve enjoyed seeing so many of you succeed and represent the PGA in your daily efforts. This past weekend, I was the Tournament Director for the PGA Junior League West Regional Championship at Chehalem Glenn GC in Newberg, OR. Branden Thompson, PGA, Mike Snyder, PGA and staff did a great job as hosts. Plus, the leadership of the OPGA Chapter were there in force to support the event, including providing a hosted ice cream truck to wrap up the event. Totally cool! Since I started here in 2012, I am happy to see some real momentum beginning for the golf professionals who’ve embraced their role in PLAYER DEVELOPMENT as an opportunity to driving revenues, more rounds, more stable memberships and more interest in our game. We are definitely heading in the right direction, but this is no time to rest on our collective laurels. 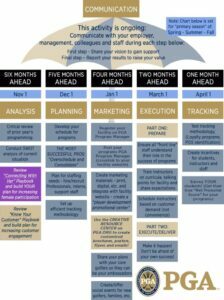 It’s time to plan for greater success in 2016! 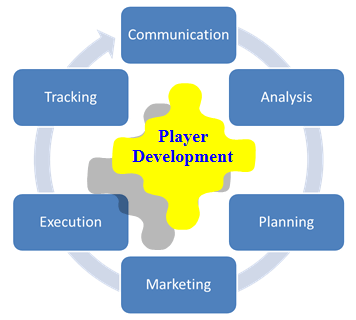 Communication is the umbrella over the rest of the Player Development Wheel. 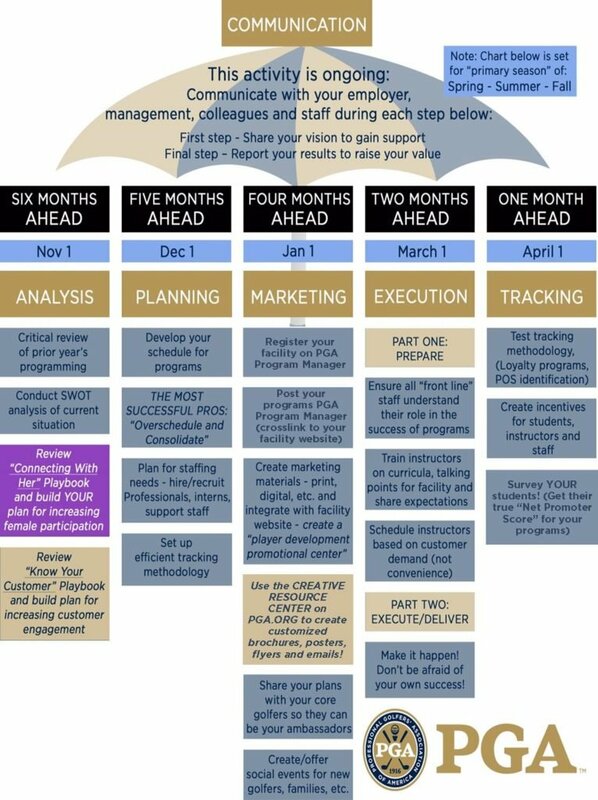 It’s not just a step, it’s ongoing and it’s about showing your “professional intentionality” to drive the measures your employer (your owner, board of directors, corporate leadership, etc.) is looking for you to deliver. You may be thinking, I communicate already (and I’m sure you do). With that out of the way, I ask you to consider how you might improve in this area. Communication isn’t about what you tell your employer, it’s about what THEY HEAR and understand from you in the communication. How many subpar decisions have we all seen due to poor communication, missing information, etc? I like to quote Mike O’Donnell, Senior Director of Player Development for the PGA, when he says, “They don’t know, what they don’t know.” Good communication is the intentional effort to fix this ever-present issue. Include key staffers/colleagues as part of the process, showing your intentionality for including them – share how you hope to create value for the whole facility, and not just yourself/your department. Share your “why” to your employer/colleagues so they can see, believe and support your efforts to drive revenue to the facility bottom line. Believe in your skills, your vision and your business acumen to present a good case for your plan. As a golf professional, you’re uniquely gifted to inspire your customers/members but also your coworkers (and maybe even your employer) I believe good communication is also beneficial because it will show your expertise, analytical skills and acumen to your employer. Lead in the “routing development” part of the plan. No one builds a golf course one hole at a time, with no regard for how that hole fits into the 18-hole course. Your plan should be no different. Sell your vision (how it includes the whole team) and share how it will drive engagement amongst your customers and membership…and that means revenue across all departments. If you don’t understand how creating “engagement for golfers” at your facility will drive proven increases in food and beverage, merchandise sales, more rounds and more stable memberships, PLEASE REACH OUT TO ME so I can share these facts with you (so you can share them with your employer). Assure delivery. When we slip an addressed envelope with a stamp in the mailbox, we expect something. Delivery. Great communication is your best way to create confidence with your employer, your staff/colleagues and other stakeholders on the front end. Delivery is the best way to ensure their trust of you, your vision and your skills grows from here. As always, it’s my hope you’ll give me the chance to help you develop your plan to be the “revenue delivery agent” your facility needs you to be. As YOUR PGA Member benefit, I would love to help you, your staff and your facility in any way I can. Please let me know how I can help you.